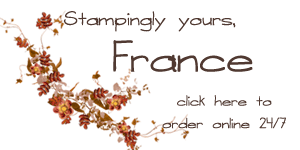 Before I talk about this Technique/Stampin 101, I have some info about the new catalog coming soon. The new catalog 2014-15 first day to order is June 2nd and the catalog will start shipping to customer May first. If you are a regular customer of mine and in the past 6 month you place orders totaling $100.00 or more a catalog will be ship automatic to you, if you would like to have a catalog ship direct to you and didn’t place qualified order in the past 6 month you just need to place an order of $50.00 this month and I will make sure one is ship to you directly. If you have any question or want to check if have you you on the list for the FREE catalog ship to you just shoot me a e-mail. Save the date April 21st is the day that Stampin’Up! will release the retiring list of stamps and accessories both stamp sets and accessories available while supplies last that is on both. In the past stamp was available till May 31st but NOT this year while supplies last. So mark your calendar for April 21st all on that list will be while supplies last. Then for this card I use the template pk #129387 Occasion and the Blossom Punch # 125603, Pansy Punch #130698, Petite Petals #133322. stamp Set Flower Shop, Petite Petals and Express Yourself (this set is a hostess set but did you know you don ‘t have to host a party to get the rewards of hostess, any order of 150.00 and above get the rewards so you can order it all or combine a few order with friends and VOILA you get the hostess rewards) . Card stock White and Calypso Coral and Designer Series Paper Watercolor Wonder #132994. For the new deal of the week that was release yesterday CLICK HERE. Thank YOU for all your support and have a great day! How did Cynthia do the center of the flower?